Click arrow above and listen. Anthropologist Sasha Alex Lessin and Aquarian Radio CEO Janet Kira Lessin interview Atlantis Rising reporter Len Kasten on his new book, Alien World Order: The Reptilian Plan to Divide and Conquer the Human Race. how the Reptilians create alien-human hybrids under their control to replace the humans who spread throughout the gallaxy to avoid the Reptilians. Long ago, the Galactic Federation sent the ATLANS, a fierce group of humans from the PLEIADES, to Earth to confront the newest colony of the combative ever-spreading alien race known as the REPTILIANS. The ensuing battle sank the continent of LEMURIA and drove the Reptilians underground beneath the Indian subcontinent as well as to Antarctica. Able to shapeshift to appear human, on Earth the Reptilians infiltrated the Atlantean civilization, abducted humans and created Reptilian HYBRIDS, as they had in 21 other star systems they conquered. Kasten shows how the Reptilians enmeshed us in a plot to enslave us and exploit Earth’s physical and biological resources. “Alien World Order examines the Reptilians’ human allies, the ILLUMINATI, who control the levers of financial, technological, and military power throughout the world through various secret societies. We learn how Eisenhower’s treaty with the Greys (signed at Holloman Air Force Base in 1954) gave the aliens permission to take humans to their spaceships, ostensibly for genetic study–in return for alien technology. These abductions led to the creation of a hybrid race under Reptilian MIND CONTROL. When Kennedy attacked the Dulles and the Nazi infiltrators in the U.S., the CIA killed him. Contrasting the Reptilians with the benevolent Ebes, the aliens from Zeta Reticuli who crashed at Roswell, Kasten exposes the stealthy tactics of the Reptilians, their relationship with the Greys, and their advanced genetic bio-technology and teleportation abilities–as well as what we need to do to defeat their plans. Here’s Len Kasten’s Serpo interview with the Lessins; click the arrow and listen. On July 16, 1965, a massive alien spacecraft from the Zeta Reticuli star system landed at the Nevada test site north of Las Vegas. Following a plan set in motion by President Kennedy in 1962, the alien visitors known as the Ebens welcomed 12 astronaut-trained military personnel aboard their craft for the 10-month journey to their home planet, Serpo, 39 light-years away. In November 2005, former and current members of the Defense Intelligence Agency–directed by Kennedy to organize the Serpo exchange program–came forward to reveal the operation, including details from the 3,000-page debriefing of the 7 members of the Serpo team who returned after 13 years on the planet. Working with the DIA originators of the Serpo project and the diary kept by the expedition’s commanding officer, Len Kasten chronicles the complete journey of these cosmic pioneers, including their remarkable stories of life on an alien planet, superluminal space travel, and advanced knowledge of alien technologies. He reveals how the Ebens presented the U.S. with “The Yellow Book”–a complete history of the universe recorded holographically, allowing the reader to view actual scenes from pre-history to the present. He explains how the Ebes helped us reverse-engineer their antigravity spacecraft and develop technology to solve our planet-wide energy problems–knowledge still classified. 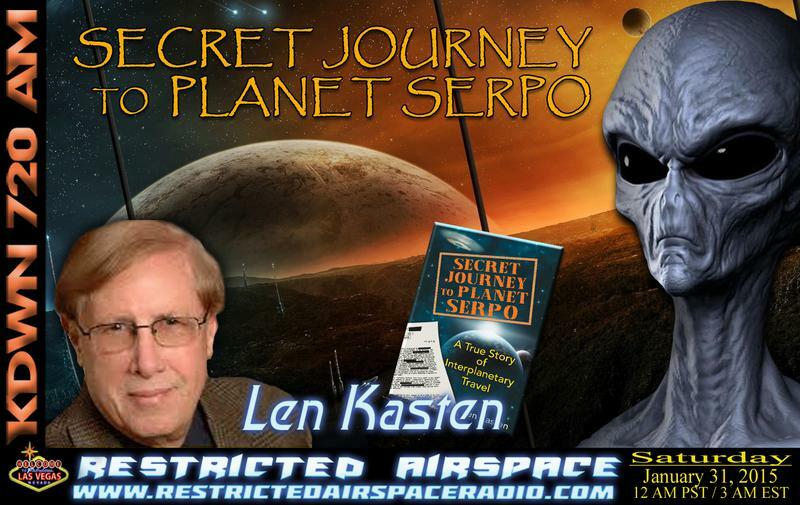 Exposing the truth of human-alien interaction and interplanetary travel, Kasten reveals not only that the Ebes have returned to Earth eight times but also that our government continues to have an ongoing relationship with them–a relationship with the potential to advance the human race into the future. The book surveys contact with ETs and abduction accounts, unexplained public and undisclosed military technology from aliens including anti-gravity devices, exopolitics (the influence of ETs in human affairs), the Iraqi Stargate, the Hybrid Project of alien interbreeding by abduction, Nazi ties to UFOS and their secret underground base in Antarctica, government cover-ups of alien interactions including Roswell, and the transformation triggered by the Hale-Bopp comet. Based on interviews with people who are witnessing the coming changes as well as those visionaries who are actually bringing them about–including John Mack, Major Jesse Marcel, Paul LaViolette, Robert Bauval, Michael Salla, and Helen Wambach–this book sketches out a breathtaking vision of the planetary revolution just around the corner. Project Serpo is the name of an alleged top-secret exchange program between the United States government and an alien planet called Serpo. Details of the alleged exchange program have appeared in several UFO conspiracy stories, including one incident in 1983 in which a man identifying himself as USAF Sergeant Richard C. Doty contacted investigative journalist Linda Moulton Howe claiming to be able to supply her Air Force records of the exchange for her HBO documentary The ET Factor and in one incident in 2005 when a series of emails were sent to a UFO discussion group run by Victor Martinez claiming that the project was real. Some variations on the conspiracy story state that the name Serpo is the nickname of the extrasolar planet. Did a delegation of US military personnel really visit another planet back in the 1960? Was this journey the secret inspiration for the film Close Encounters of the Third Kind? We explore these questions with UFO researcher Len Kasten, who has found some provocative evidence that this legendary journey might actually have taken place. The story continues of a relationship between the American government and the people of its home world – said to be a planet of the binary star system Zeta Reticuli. there are others things going on that has been kept secret for some time. SInce they are now on the way and well established, we know that a chnage over is in the offing. It was predicted long ago and has been fulfilled as promised. The dark races tried to stop it, but their efforts came to nothing.